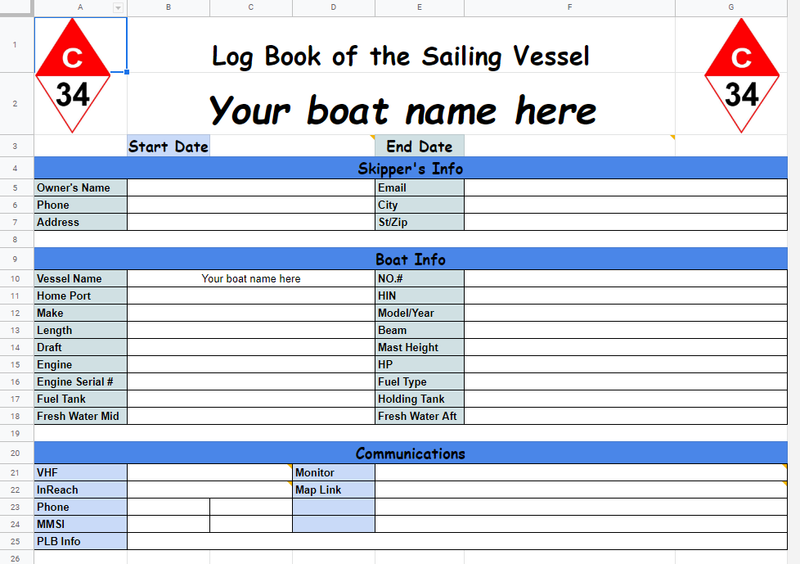 We've wanted a ships log for quite a while, now, planning our first decent sized cruise, it's time to get it done. After looking over the options online, I asked my FB buddies for input and this is what I put together. Usage - explains how we use it, and how others can download it to edit / use themselves. Boat Info - Basic Boat info that identifies the Boat, and Important info such as Engine, Fuel, Water, Communications etc. I'll probably modify this from time to time. Trip Info - My concept is that each time we take a trip, we'll start a new Trip Info page. It includes typical info about a trip, where we're going from, where too, who's going and when. Short trips will only use this page, longer trips will use addtional 'Watch Info' pages. 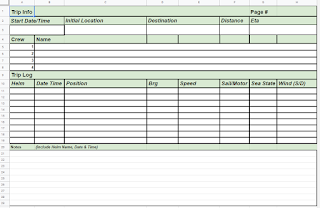 Watch Log - Longer trips will use one or more of these pages in addition to the Trip Info Page. 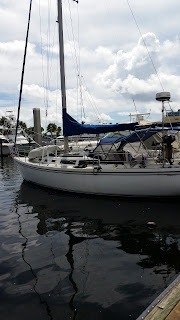 Our planned use is to keep the Log Book on the Nav Station in the Cabin, and keep the current Trip Info page or Watch Log page at the helm. 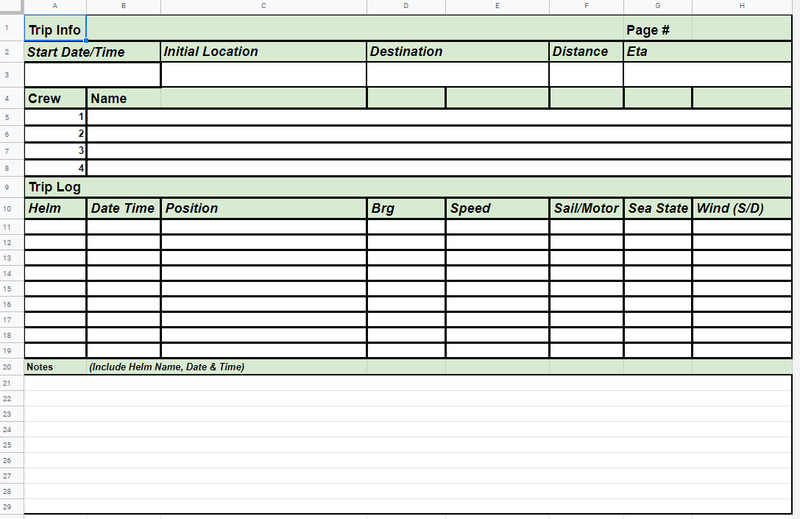 The helm will make entries on either the Trip Info page or the ongoing latest Watch Log page. 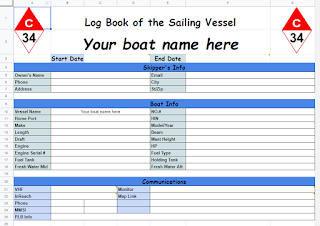 On change of helm, the off-going helm will update the chart with the info from the Info Page or Watch Log page. Ideally, the on-going helm will make their first annotation in the log so that they are cognizant of position, sea state, wind conditions etc. Ideally they would get to review the off-going log entries too. 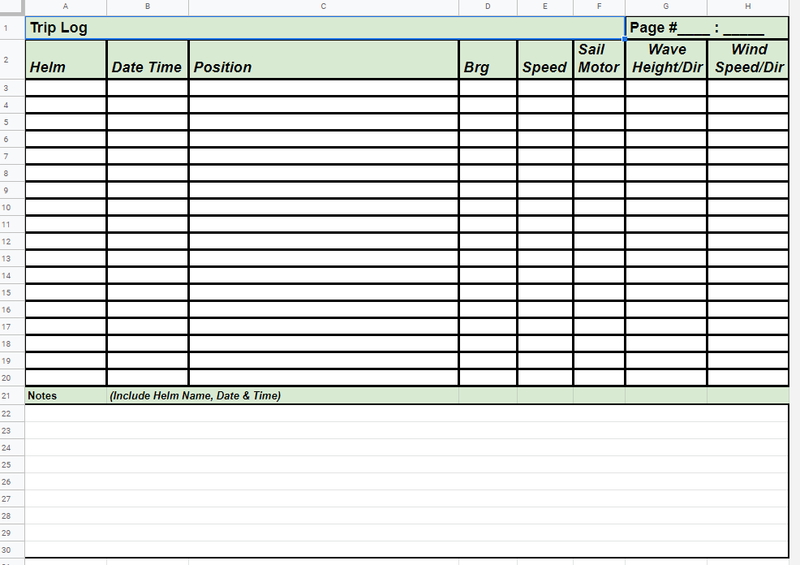 As long as the Position Log info is transcribed to the Chart. 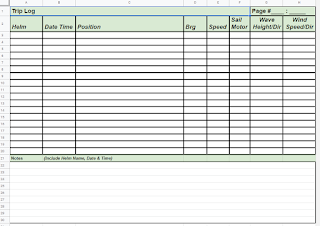 The worksheet is downloadable from my google drive. I would appreciate any comments about the content or use.